both based abroad, account for Antarctica's limited economic activity. Shetland Islands by British Capt. William Smith. Capt. John Biscoe, in the Tula and Lively. discovered and landed on the Balleny Islands. explorer Sir James Clark Ross in the ship Erebus. by American Capt. Mercator Cooper in the Levant. the first party to winter on the continent. the South Pole but died on the return trip. over the South Pole from Little America Base. obscure harbor on Kergulen Island. of 67 nations research the environment. Ross Sea via the South Pole. by a tractor traverse by the Soviet Union. 23 Jun 1961 Antarctic Treaty enters into force. (of 11 Feb 1972) enters into force. Fauna and Flora (of 2 Jun 1964) enters into force. the Ross Dependency established by Greenpeace. 1 Sep 2004 Secretariat of Antarctic Treaty inaugurated. 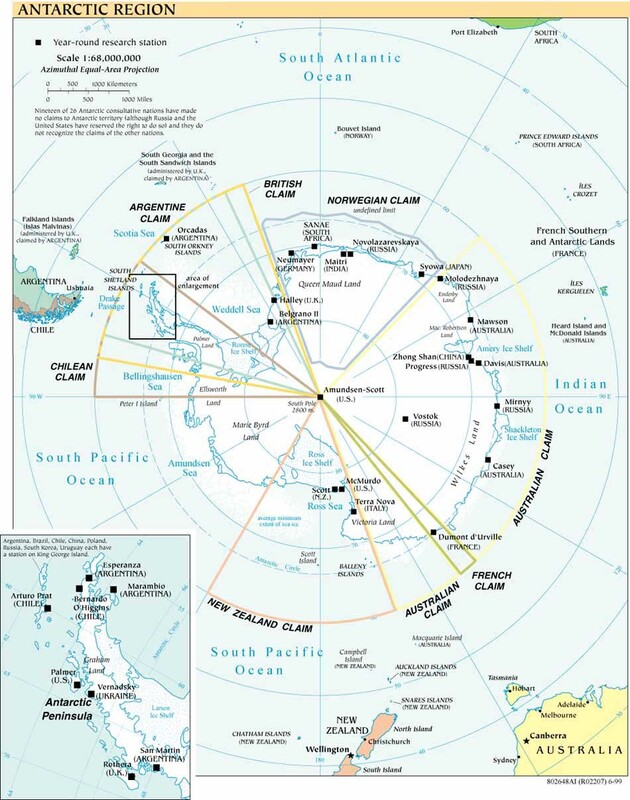 Antarctic Treaty — The Antarctic Treaty, signed on 1 Dec 1959 and entered into force on 23 Jun 1961, establishes the legal framework for the management of Antarctica. Administration is carried out through consultative member meetings. Summary: Article 1 - area to be used for peaceful purposes only; military activity, such as weapons testing, is prohibited, but military personnel and equipment may be used for scientific research or any other peaceful purpose; Article 2 - freedom of scientific investigation and cooperation shall continue; Article 3 - free exchange of information and personnel, cooperation with the UN and other international agencies; Article 4 - does not recognize, dispute, or establish territorial claims and no new claims shall be asserted while the treaty is in force; Article 5 - prohibits nuclear explosions or disposal of radioactive wastes; Article 6 - includes under the treaty all land and ice shelves south of 60 degrees 00 minutes south and reserves high seas rights; Article 7 - treaty-state observers have free access, including aerial observation, to any area and may inspect all stations, installations, and equipment; advance notice of all expeditions and of the introduction of military personnel must be given; Article 8 - allows for jurisdiction over observers and scientists by their own states; Article 9 - frequent consultative meetings take place among member nations; Article 10 - treaty states will discourage activities by any country in Antarctica that are contrary to the treaty; Article 11 - disputes to be settled peacefully by the parties concerned or, ultimately, by the ICJ; Articles 12, 13, 14 - deal with upholding, interpreting, and amending the treaty among involved nations; other agreements - some 200 recommendations adopted at treaty consultative meetings and ratified by governments; a mineral resources agreement was signed in 1988 but remains unratified; the Protocol on Environmental Protection to the Antarctic Treaty was signed 4 Oct 1991 and entered into force 14 Jan 1998; this agreement provides for the protection of the Antarctic environment through six specific annexes: 1) environmental impact assessment, 2) conservation of Antarctic fauna and flora, 3) waste disposal and waste management, 4) prevention of marine pollution, 5) area protection and management and 6) liability arising from environmental emergencies; it prohibits all activities relating to mineral resources except scientific research; a permanent Antarctic Treaty Secretariat was established in 2004 in Buenos Aires, Argentina. South African Antarctica South African unverified claim: 1963 - 1993? 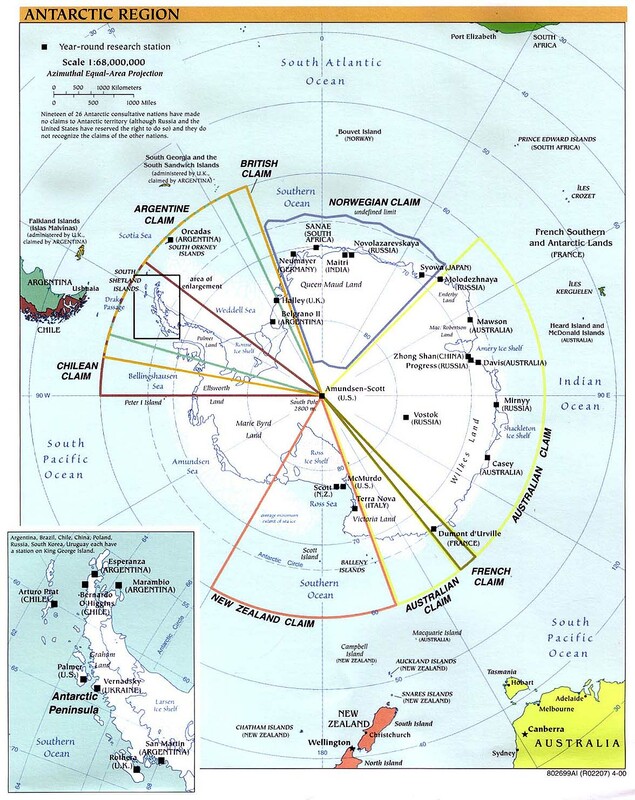 Antarctica Territorial Disputes: The Antarctic Treaty freezes claims (see Antarctic Treaty Summary in Government type entry); sections (some overlapping) claimed by Argentina, Australia, Chile, France, New Zealand, Norway, and U.K.; Australia, Chile, and Argentina claim Exclusive Economic Zone (EEZ) rights or similar over 200 nm extensions seaward from their continental claims, but like the claims themselves, these zones are not accepted by other countries; 22 of 29 Antarctic consultative nations have made no claims to Antarctic territory (although Russia and the U.S. have reserved the right to do so) and do not recognize the claims of the other nations; no claims have been made in the sector between 90 degrees west and 150 degrees west; the International Whaling Commission created a sanctuary around the entire continent to deter catches by countries claiming to conduct scientific whaling; Australia has established a similar preserve in the waters around its territorial claim.